You can omit the herbs and garlic in the cheese, but if you take a few extra minutes to mix them in, you'll be rewarded with a bolder-flavored panino. Or you can save time by purchasing an herbed fresh goat or cow’s-milk cheese. 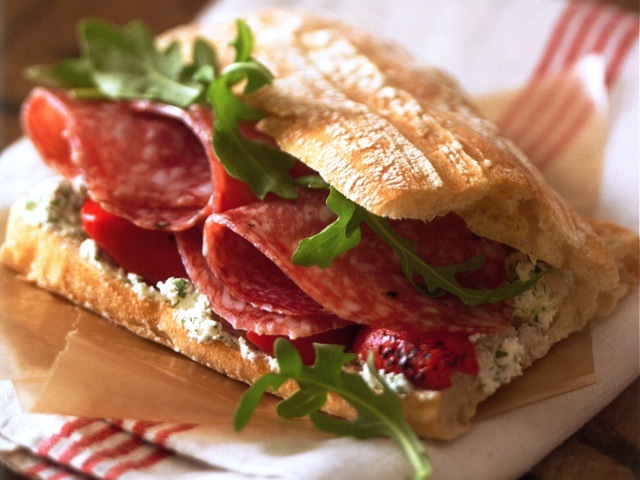 Any salame — hot, mild, or herbed — will complement the other ingredients. In a small bowl, stir the goat cheese briefly to smooth it out. Add the chives, parsley, and garlic, and mix well. Spread the goat cheese on half of each roll. Top with the peppers and then the salame. Drizzle a bit of olive oil on the other half of each roll, then top with some arugula leaves. Close the sandwiches and serve.